How do you keep your pool balanced every day without lifting a finger AND eliminate the most hazardous chemical you put in the pool? By balancing your pH organically with a TOTALBalance pH Control System - manage your pH automatically without adding a drop of acid! It's a revolution in pool care. A balanced pH is the foundation of your swimming pool - it ensures perfect swimmer comfort, it enhances pool sanitation, and it protects your pool surfaces & equipment. The problem is that pH is always drifting, and you typically have to add concentrated acid to balance it (a dangerous, caustic chemical). 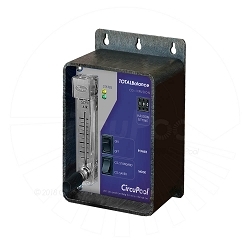 Instead, the TOTALBalance system is an easy add-on to your pool equipment that balances the pH using a patented CO2 infusion process. Perfect pH is maintained every day - safe, natural, 100% effective.